For many years I have played guitar; it is a satisfying part of my creative practice. One step away from the drawing table and I’m in a completely different zone; working in patterns on a field of time; focusing on completely different visual, tactile, and aural sensations than working with watercolor and brush. 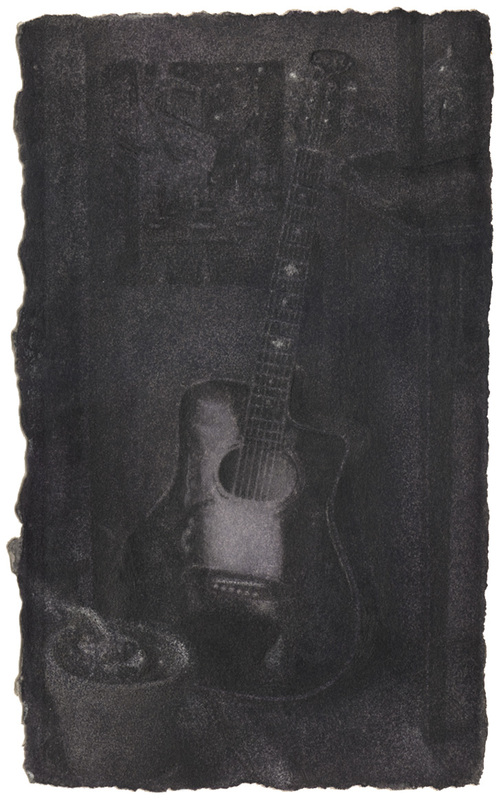 Even a short session away with the guitar returns me to the drawing table with fingers, eyes, and mind realigned and re-sensitized. I’m a self taught rhythm guitar player, so I welcomed the opportunity to take some lessons from a professional; something I assumed would be instantly gratifying and quickly lift me into a different plane of playing. How wrong I was. I immediately discovered what a hole I had dug playing alone in the studio over the years. Sliding beats, fuzzed out notes; I had settled into a pattern of sloppy strumming and improvisation without accountability. It became clear by the end of the first session I was going to have to begin again. So, in response, rather than the busy strums I’ve packed into each measure I’m stripping down to a single chord per beat; playing only the downbeat. I check each note for clarity; how it sounds on its own, how it sounds in relation to the whole. When collaborating with my teacher I now listen beyond my playing; what is my partner doing? Where is he in the music? Where might he want to go? How is my part serving his part? The experience reminds me of making prints at Center Street Studio this past May. There, with my partner Jim, I found myself responding to what was happening with the printmaking process. When the photographic didn’t serve us properly, I drew the images by hand. During the unexpected detour I slowed my line down, learning to enjoy the feel of the needle pulling through etching ground as it exposed the copper of the plate. I cultivated clarity of line and tried to make each line serve the whole of the composition. Perhaps this slowing down and focusing on essentials will inform the next step of adding tone to the prints when I return to Center Street Studio next week. I’m also meditating what possibilities this approach might bring to my drawing. As a side note, a number of artists of significance were excellent musicians. For example, Paul Klee almost chose a different career as a first-class violinist and John Singer Sargent was an accomplished pianist.